The Centre for Jazz and Popular Music will present Durban band Blvck Crystals on Wednesday February 13, 2019. In 2016, pianist Jaedon Daniel arranged some of his original music for a rather unorthodox combo, consisting of bass, guitar, drums, keys, saxophone and two lyricists. After the first gig, the band decided to take the idea seriously and pursue it to the max. All of the musicians involved were previously friends at UKZN and the rappers based in Cape Town. As the band performed at most of Durban’s music venues, the music began to grow and form a life of its own. The sound was very experimental and alternative, highly influenced by jazz and hip hop, infused with several other genres. The chemistry as a band grew far beyond anyone’s knowledge and what was always very clear to see, is the bond between one another. In July 2016, the band independently planned a successful tour to Cape Town, playing at a few of the well-known music venues. The band’s reputation grew even more and so did the demand for the music. The following year in 2107 the band were fortunate enough to get selected for the Concerts SA regional fund which allowed them to travel to Maputo Mozambique which consisted of performances at local popular venues, TV stations, radio stations and school workshops. The band is planning future tours, and studio recordings in the near future. 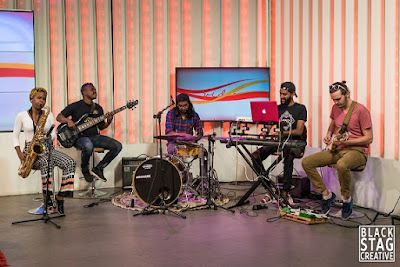 The Blvck Crystals comprises Nick Pitman (guitar), Freeman Gumede (bass), Sinalo (trumpet), Siyalo (trombone), Riley Giandhari (drums), and Jaedon Daniel on (keyboard). The performance will take place at The Centre for Jazz and Popular music (CJPM), Level 2, Shepstone Building at UKZN Howard College Campus on Wednesday February 13 at 18h00. Doors open at 17h30. General admission R80 (R50 pensioners, R25 students). Tickets at the door.